The New Totalitarianism is surveillance: money and power in the hands of those who watch, who surveil. This really only began after 2009. Based on asking what it is like to live in the Embassy, he answered in an interwoven way that tied back existing in a prison-like environment he exists in to finally saying he is in a bubble without police. Why hasn’t anyone been fired post-Snowden? There has been no significant response. Inductive of the Deep State, power of military contractors and intelligence in U S A. People, journalists self-censor because they are scared. How can individuals do something about it? Cannot hide, cannot be spared by being innocuous. Even Petraeous could not be spared. Algorithms exist to track psychology behind our activities. Degrees of our friendships can be analyzed. We are all part of state whether we like it or not, including managing what laws and activities are acceptable. We are part of a new body politic, like on an island. We are constructing a new way of being, but not consciously. Perception of power is all big organizations need. They don’t need to kill you, just to make you think they can to effect change on your behavior. Wikileaks push back on appearance of fear. Continues publishing. His hope is this will giv us courage to stand up against awful great powers, you can do it. Your info is in a permanent record. You have to think of how this info might be used against your future self. Back to thinking about Verizon’s efforts to cut costs and finding themselves in the midst of a strike, I just stumbled across this amazing quote by Robert F. Kennedy talking about GNP. These lines actually propose a challenge to the philosophy of setting a goal of “GNH” (Gross National Happiness), as the Bhutanese have done. 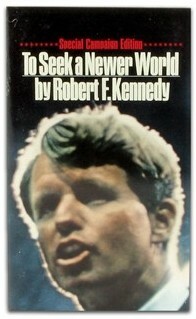 Mr. Kennedy seemingly goes beyond GNP or GNH to propose something that seems quite noble. (Quote is not from this book, but the title expresses the vision). … this is one of the great tasks of leadership for us, as individuals and citizens this year. But even if we act to erase material poverty, there is another greater task, it is to confront the poverty of satisfaction – purpose and dignity – that afflicts us all. Too much and for too long, we seemed to have surrendered personal excellence and community values in the mere accumulation of material things. Our Gross National Product, now, is over $800 billion dollars a year, but that Gross National Product – if we judge the United States of America by that – that Gross National Product counts air pollution and cigarette advertising, and ambulances to clear our highways of carnage. It counts special locks for our doors and the jails for the people who break them. It counts the destruction of the redwood and the loss of our natural wonder in chaotic sprawl. It counts napalm and counts nuclear warheads and armored cars for the police to fight the riots in our cities. It counts Whitman’s rifle and Speck’s knife, and the television programs which glorify violence in order to sell toys to our children.